For most forms, emailing a single person or group of people is all you need. However, there are sometimes occasions to change the email recipients depending on some factor, such as the field input values or the page that a form appears on. Luckily, Formulate offers a number of options to facilitate this; I’ll explain a few of them. A “Pair List” data value, with the value of each being an email address. 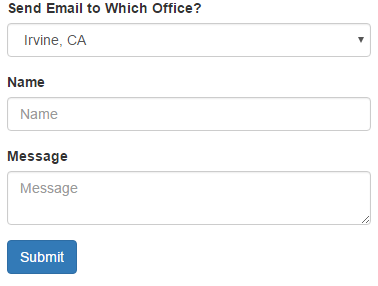 The “Recipient Email Fields” has the “Office” field selected. Now, when the form is submitted, an email will be sent to the email address indicated by the drop down selection. Suppose you have a business with multiple offices, and for each office, you have a “Location” page. You might display a form on those pages, but the recipient should change depending on which page the form appears on. The manual way of implementing that would be to create a new form for each and every location page. That would take quite a bit of time. There’s a better way. Create a field on your “Location” document type called “Email Recipient”. A content editor will type in the email addresses on each location page. Then you create a form like normal and have it display on your location pages. Create a “Text Constant” field named “Automatic Recipient” with the “Dynamic Email Recipient” category selected. Add an “Email” handler to your form. Ensure your “Automatic Recipient” field is chosen as one of the recipient email fields. Now you just need to write some code to populate that field value when the form is submitted. /// Sets the "Dynamic Email Recipient" field based on the current page. /// The form submission context. // Find the "Dynamic Email Recipient" field (exit early if not found). // Get the recipient email address from the current page. // Copy the field data into a new list. // Set field data to the email address. // Ensure the modified field data gets used. /// Merges the specified field value into the collection of field submissions. /// The collection to merge the field value into. /// The field to merge. /// The value to merge in for the field. That’s all there is to it. Your form submissions will now be emailed to whatever email address you specify on the content node the form was submitted from. You can customize that logic to suit your needs. For example, the email address may depend on some other factor, such as a location page’s state. And there’s no reason that email address needs to be stored in Umbraco; it could be stored in some external database or be acquired via a web service. Formulate allows you to customize to your exact needs.